Andrew was there too, working for the board game gods. I mean, Asmodee. Okay, so that title got a bit away from itself. Oh well, the point still stands: welcome back! I mean, of course, to myself, as I’ve been on a several-month hiatus (I didn’t count), and this day marks my return to active dragon-slaying duty. 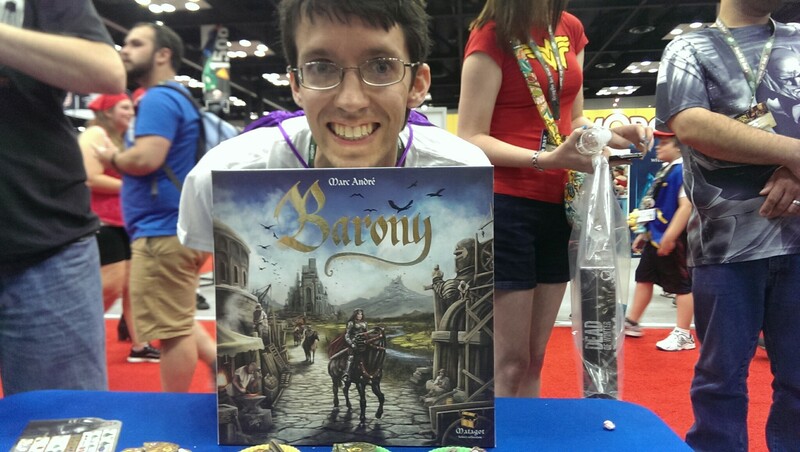 Because it was Gen Con! Which I also welcome back for another year. What a con! This was my first year of attending all four days. What a doozy! On the one hand, that’s a lot of time to try out all the stuff I wanted to try out. On the other hand, I’m usually wiped after 2 days of demoing and staying up late playing games. Staying a third full day and even stopping back for a fourth really Pushed the Limit, but don’t worry, I’ve got some green maneuvers planned so I can remove that stress token. 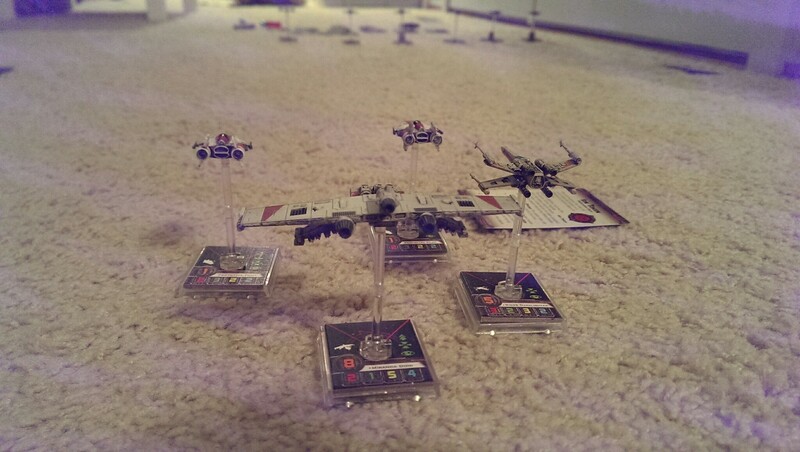 There’s an X-Wing joke hidden in this photo. Probably. Anyways, just like last year, I’m breaking out my Gen Con posts over the course of the week, rather than try to shove everything into one big post. I’ll give you some writeups on all the games I played, including some on the distant horizon (known as Essen). I’ll share some photos. And what a variety of games we have. Surviving alien attacks in space. Surviving crisis after crisis (and betrayal) in space. Picking up jobs with your trusty Firefly-class transport and oddball crew, in space. Surviving the grim darkness of the far future in space. Heck, we even rooted out the spy by asking if he’d go outside and get a hotdog… in space. And there were non-space things too. Pirate ships, the old west, zombie towns, Dracula-infested Europe. Time-travelled insane asylums. Hospitals. Back rooms of mafia headquarters. Ancient egypt. All in all it was a well travelled con. As always (I had to start the sixth paragraph in a row with an A, you didn’t even notice til I said that though), I’ll finish off the week (or two) with a final wrap-up of personal thoughts and reflections on the con, the state of the hobby, and gaming with friends. Enjoy! Or not. It’s really your choice.